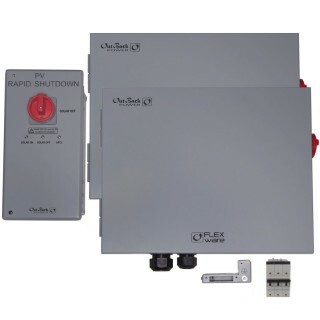 The FLEXware ICSPLUS-2 System is rated to 600VDC for integration in a wide range of systems and designed for ease of service and clean wire management. This packaged system is designed to be an easy-to-order, complete solution for battery based systems and includes two combiner boxes, while individual components can be ordered for alternative system needs, including use with grid-direct PV inverters. When used with OutBack power conversion and energy storage components, the system will represent the only single-brand UL and NEC-compliant solution from rooftop to battery. The primary component in the ICS Plus system is the DC combiner box. The ICSPLUS-2 combines up to twelve PV strings within (2) FWPV6-FH600-SDA combiners which are rated for 15A or 20A fuses (not included) and a combined capacity of 96A and 600VDC. It includes (6) 600 VDC DIN-mounted fuse holders and provides an overcurrent protective device (OCPD) for each circuit. The AFCI device is located here. The combiner provides a means of disconnecting locally, while also providing a means for PV rapid shutdown functionality to de-energize PV circuits within 10 feet of the PV array. NOTE: Charge controllers are sold separately.